This post is my response. This is Fairfield, California. The town was founded by a sea captain from Fairfield, Connecticut back in 1856. He established the town as the county seat and contributed to its early growth and economic development. The historic downtown is a vestige of traditional small town Main Street America and has good bones. Depending on which day and hour you arrive and which direction you point the camera you can say it’s either fair-to-middling or moribund. It’s a little of each. What was a thriving commercial district and regional hub for the larger agricultural county in its heyday experienced a structural shift after World War II. Walking around you can see how the older downtown was incrementally modified to accommodate a new reality. Television meant people went to the movie theater a lot less often. The rise of automobiles meant older devalued buildings were pulled down and replaced with parking lots. And the ornate architecture of earlier eras was surpassed by a stripped down pragmatic mid century approach to building. More recently the city recognized the comparative advantage of its historic urban fabric which is back in fashion. There was a concerted effort to reverse course. The usual cosmetic improvements were deployed to try and bring back some of the qualities that existed a century ago. Brick pavers, outdoor furniture, decorative lamp posts, public art, planters, and street trees were incorporated into the downtown plan. 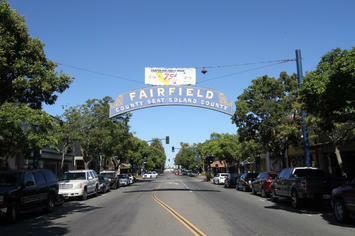 But Fairfield’s Main Street (technically Texas Street) is still a bit lackluster. The town did the things it could to revive the older neighborhood, but there are larger structural forces at work. Just beyond the part of Fairfield’s Texas Street that peaked in the 1920s is a stretch of commercial establishments that were built in the 1950s and 1960s. These were the shiny new businesses that stole the thunder from the older businesses. But these buildings are now at the end of their useful life. The structures are deteriorating and there isn’t enough market demand to support the space. Collectively these half dead low rent strip malls and semi vacant parking lots create the impression that things aren’t going too well for Fairfield. And you need to drive past these places in order to get to the historic chunk of town. No amount of decorative flags, ornamental shrubbery, or brick paving can save this bit of Texas Street. This series of signs describes the many occupants of a single commercial building over the years: dance studio, storefront church, auto repair shop… Notice the “Historic Route 40” sign posted by the local authorities. This stretch of town is special because you can’t find architectural gems like these just anywhere, right? A bit further down Texas Street there’s a retail plaza built in the 1980s. This place is one of the reasons the 1950s stores declined and failed. There’s a continual migration to new spaces on the edge and a hollowing out of everything that’s just a generation older. Built in 1981 the Solano Town Center Mall is a million square feet of retail space. Macy’s, Sears, JC Penny… They’re all either closed or dead men walking. The age of the department store is over. Once the anchor stores die the rest of the mall crashes and burns. Notice how the restaurant pod out on the edge of the parking lot is being pressed in to service as a Halloween spook house. (I took these photos in October.) It’s a brave and desperate attempt to keep the space activated. Next stop is likely an Evangelical ministry followed by a mysterious fire. What’s left of the mall is being rebranded as a place to go for activities rather than mere shopping. McDonald’s, Pizza Hut, Panda Express, Subway. It’s so hard to find dining experiences of this quality anywhere else… The problem is that the mall and the historic downtown are both trying to capture the market for “third place” non retail activities and there just aren’t enough warm bodies or disposable income to carry it off. The stuff in between? Aging strip malls on the side of a six lane arterial road are a hard sell for people looking for excitement. And here’s what’s beginning to fill the void. The suburbs were intentionally built to exclude people below a certain economic threshold. Middle class families with school age children were always the gold standard. But Fairfield is struggling to attract the “right” demographic. Just as there’s always a shiny new big box store a little farther down the road, there’s also always a fresh housing subdivision and a newer school district just over the next hill. So the vacuum in Fairfield is slowly being filled by people farther down the socioeconomic scale. Let’s get back to the Captain Hindsight Award. If you understand how things got to be the way they are you can see more clearly into the future. What I do on this blog is point out what should be painfully obvious, but isn’t. Our institutional structures create a dynamic that induces new growth with subsidies, tax policies, infrastructure expansion, and a general culture of new, new, new. But what we build is disposable. The average commercial property is fully amortized and depreciated in fifteen years. After that it starts its long slow slide toward the glue factory. Municipal insolvency follows. If I sound negative for pointing this reality out to people it’s not because I’m a doomer. I’m simply describing how things work rather than how people inaccurately interpret things. Your town didn’t decline because the “wrong element” moved in and ruined it. It wasn’t waste, fraud, and abuse by incompetent government officials. It wasn’t corporate greed. No. Your town was a time bomb from the get go. But the fuse was so long that no one noticed until the detonation hit. I’m going to end on a positive note. Fairfield has amazing potential. Its older housing stock close to downtown is charming. It has every quality and characteristic that lends itself to a bright future. At any moment it could be rediscovered by a new generation and infused with fresh energy and investment. That’s a very real possibility. But a different approach to growth and development might be in order first. This piece originally appeared on Granola Shotgun.